Dogs and cats are classified in the order Carnivora. This word stems from Latin - carõ (stem carn-) "flesh" and vorãre "to devour". Within this order, there are two suborders: feliforms ("cat-like") and caniforms ("dog-like"). Their nutritional requirements are quite different. Cats, unlike dogs, need meat to fulfil all their dietary requirements (they are referred to as obligate or true carnivores). Dogs on the other hand, similar to human beings, can utilise a mixture of plant and animal products and are therefore also sometimes referred to as being omnivorous). What nutrients do dogs require? Dogs require a combination of macronutrients and micronutirents. Macronutrients are those that are required in large quantities and include protein, carbohydrates and fats. Micronutrients are required in small quantities and include vitamins and minerals. The source of the proteins and fats is less important than the quality and digestibility of these essential nutrients. On an experimental basis, dogs can thrive if they are fed a properly balanced vegetarian diet because they have the ability to use plant sources to synthesize taurine, arachidonic acid and vitamin A from precursors present in plants. Cats on the other hand, do not have the ability to do this and therefore have to get these essential amino acids and micronutrients in directly through their diet. Because dogs are omnivores (everything eaters) they do best if they are fed a diet which is derived from both animal and plant sources. A pure meat diet without extra supplements would be unbalanced and would not provide all the nutritional requirements for the dog. Water is the most important nutrient and is essential to life. It accounts for 60-70 percent of an adult pet’s body weight. Food can provide some of the daily water requirement but all pet’s need to have fresh and clean water available at all times. As research into canine nutrition has grown and expanded, we know that a well-balanced diet must include appropriate amounts of minerals, vitamins, certain essential amino acids (the building blocks of proteins) and specific essential fatty acids (the building blocks of fats). These components are needed to build and maintain healthy tissue and carry out important biological functions within the body. The requirements for these nutrients and the necessary amounts vary with the different life stages (puppy, adult, pregnant, nursing or mature dog). To meet their energy needs, dogs are able to utilise fats and proteins as energy sources but they can also use carbohydrates. The dog’s digestive system does contain enzymes that can break down starch and sugars. However more complex carbohydrates such as grains are better utilised when they are cooked. The best advice that can be given is to feed your dog the highest quality food that you can afford. There are a multitude of dog foods out there and it can often be confusing trying to choose one. The best way to choose a food is to ask your veterinarian what would suit your particular dog at a certain age. Select a diet with recognisable, whole food ingredients. If the majority of ingredients sound foreign to you then it is best to select another diet. Select a low calorie diet. Most dogs that spend a lot of time indoors and are spayed or neutered have lower energy requirements. Obesity, just like in people, is becoming a real problem in our pets. If your dog is particularly active, there are diets to suit their needs. Feed for the life stage. Much research has gone into the food requirements at different stages of your dog’s life. Puppies have different requirements to adult dogs. In the same way a nursing dog compared to an older mature dog has very different nutritional requirements. Only a few decades ago, we were making the mistake of supplementing large breed puppies’ diet with extra calcium and carbohydrates, reasoning that the fast growth these animals experience requires some extra nutrition. We now know that this is one of the worst things one can possibly do and new generation diets for large breed pups are actually restricted in these ingredients to ensure a slower and more solid growth curve for these animals. There are a multitude of different foods available to suit your dog’s particular life stage and you would do well to discuss your particular dog’s requirements with your vet. How do you know how much to feed? Is it okay to feed your dog once a day? Dogs were originally hunters and their digestive tracts had evolved to allow the intake of large meals, followed by a period of fasting. However, feeding your dog twice a day is recommended these days. It has been suggested that large meals once a day can be a predisposing factor to large breed dogs developing bloat. 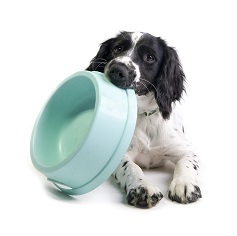 Not all dogs will eat the same amount twice daily and most will prefer either morning or evening to feed. Exercise should be restricted immediately after food, to avoid any digestive upsets and reduce the risk of conditions like bloat or intestinal obstruction. A dog should also have access to fresh and clean water at all times. What do you need to know about feeding puppies? For the first four weeks of your puppy’s life, they will be solely dependent on their mom for milk and they will feed every few hours. From three to four weeks, puppies will be introduced to solid food but still need to have access to their mom’s milk. Puppies are generally weaned at about six weeks but it is important that they stay with their mom and littermates until about eight weeks. Puppies need relatively large amounts of food as they grow very fast. However their stomachs have limited space. Initially a puppy may need to be fed four to six times a day. Between three and six months the frequency of feeding can probably be reduced to two times a day. Good quality puppy foods have been specifically formulated to take into consideration the rapid growth of baby dogs. They contain the correct amount of energy and protein as well as important minerals such as calcium. It is important to remember that what you feed your puppy will have an effect on his or her health later on in life. Feeding the best quality food you can afford will definitely be beneficial to your dog and provides a good basis for a dog that can thrive. In small and medium sized dogs, growth is generally complete by eight to ten months, so puppies can be moved to an adult food from twelve months of age. What is special about large and giant breed puppies? A large breed dog is generally defined as any dog that will have an adult weight greater than 25 kg and giant breeds generally have an adult weight of greater than 50 kg (adult weight reached at 12 - 24 months of age). Large breeds include breeds such as Labradors, Golden Retrievers and German shepherds. Great Danes and Irish Wolfhounds are examples of giant breed dogs. Given the size of these breeds, they are at a higher risk for developing conditions such as elbow and hip dysplasia and other growth abnormalities. It is very important to feed these puppies a large or giant breed puppy food. These foods have been specifically formulated and contain the right amount of macronutrients as well as calcium (they typically have restricted levels of fat (total calories)) and calcium, to ensure that they do not grow too rapidly. Feeding a normal puppy food to these breeds may lead to joint abnormalities as they may grow too fast. It is often recommended to feed large and giant breed puppies on a puppy food until they are 18 months old. Maintaining their body condition at this stage is also important, as being overweight will also put extra strain on their joints. What should older dogs be fed? Dogs are considered mature after seven years of age. Their nutritional needs change as they become older. Mature dogs require fewer calories, so foods will contain fewer carbohydrates and fats. Excess protein and sodium can put extra strain on the kidneys so they require a diet with an adequate amount of high quality protein and lower sodium. Foods should also contain antioxidants and Omegas 3 and -6 to combat inflammation and keep systems like the brain, skin, kidneys and intestinal tract healthy. Probiotics and some fibre helps with intestinal health, and joint supplements such as glucosamine and chondroitin sulphate helps to combat arthritis. Modern high quality pet foods have the correct balance of these supplements and nutrients to provide optimal health for your dog. There are a huge variety of good quality foods available to feed your dog and choosing one can be overwhelming and confusing. It is important to feed for the life stage and size. With the aid of your veterinarian or veterinary health care provider, try to select a food that is based on sound scientific research and principles. There are foods available for different ages and conditions and nutrition remains one of the most important aspects to maintaining a healthy and happy dog.